Well, I certainly hope that statement rings true as Snap-on Inc. has been on my dividend stock watch list for the last couple of months. And as much as I wish that I could turn back time to when I first bought $SNA at $149/share, I had to acknowledge that it is perfectly okay to average up in cost-basis when a stock that has had a nice run presents a buying opportunity. Snap-on Incorporated may not be a household name unless you have a mechanic in the family, as they manufacture tools, diagnostic equipment, and additional service equipment to professionals worldwide. While I’ve been familiar with the brand, it isn’t anything I ever bought as their tools aren’t sold in retail establishments. With both of my boys working in automotive repair shops, the Snap-on dealer truck makes routine stops and the employees can buy tools off of the truck or place orders for tools and equipment, and we now have an assortment of Snap-on tools. Their tools are not cheap–but they do come with a lifetime warranty, which appeals to the mechanics that use these tools every day. To give you an idea on their cost, it is not unusual for a rolling tool chest to run anywhere from $5,000 on the low-end to $15,000 or more on the high-end. Zoinks! Snap-on operates through multiple internal groups, including: Commercial & Industrial Group, Snap-on Tools Group, Repair Systems & Information Group, and Financial Services segments. The company was founded in 1920 and is headquartered in Kenosha, Wisconsin. 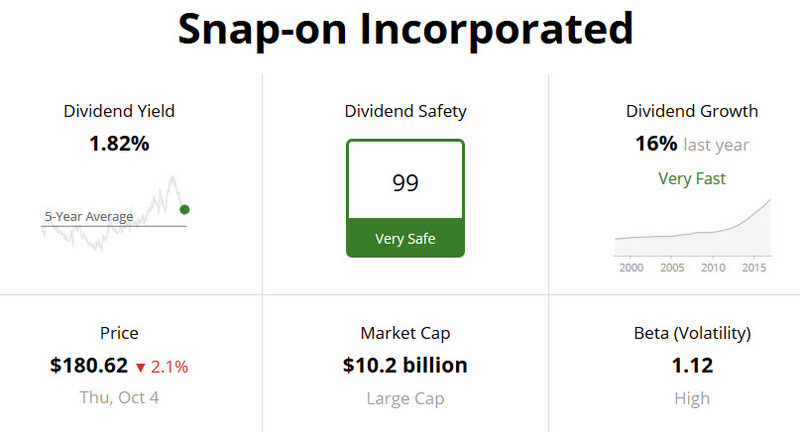 While Snap-on will not necessarily impress you with their dividend yield like Altria Group, they definitely will catch your eye with their outstanding track record of dividend growth. The above snapshot highlights their dividend safety as well as key metrics such as the current dividend yield, market capitalization, beta, and dividend growth as calculated and reported by Simply Safe Dividends. Note: Simply Safe Dividends is another tool that I’ve added to my dividend toolbox along with FAST Graphs. As shown above, their most recent dividend growth has come in at 16% and this is remarkably consistent with their recent history over the last 5+ years. Their yield of 1.82% might turn some people away, but it is important to have a mix of high-yield holdings along with high-growth holdings–and Snap-on definitely meets the mark for the latter. Earlier I mentioned that I have been hesitant to add more to my Snap-on position because the price had run up ~25% since my initial purchase. However, lately I have been including analysis of a stock’s current dividend yield and P/E ratio in comparison to their 5-year averages in helping me determine potential buying opportunities. In the snapshot above, you can see that their current yield of 1.82% is still a good margin above their 5-year average dividend yield while their current P/E ratio is below the 5-year average P/E ratio. Both of these tell me that the stock may be undervalued right now. 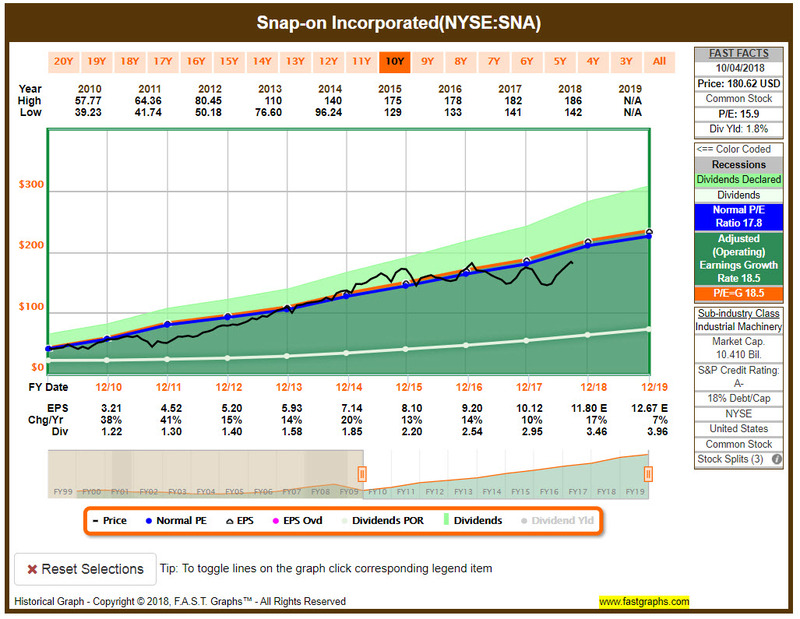 Taking a look at Snap-on in FAST Graphs, we see that they are currently trading at about a 11.8% discount to their normal P/E ratio and again this signals that the stock may be undervalued right now. 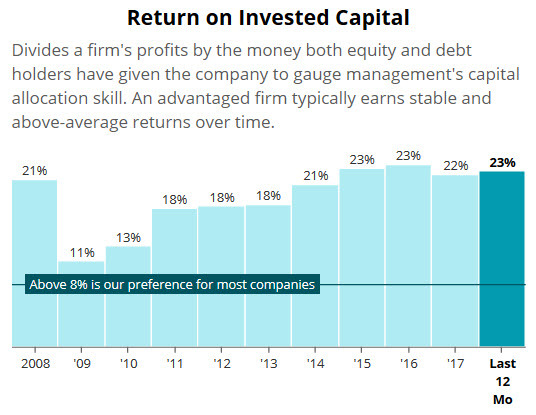 While these indicators may demonstrate that a company’s stock is undervalued, they can also indicate that there are problems with the fundamentals of the company. Therefore, we will also take a look at a few additional metrics to see how the company is performing. Here we see that Snap-on’s earnings per share have been on a steady climb since the Great Recession and they have been quite consistent in maintaining their payout ratio in the neighborhood of 27-29%. My guidelines call for a payout ratio below 60%, therefore Snap-on has plenty of coverage for their dividend including continued growth. Taking a look at their Return on Invested Capital, which is a calculation that can give us insight into how well a company uses their money to generate positive returns, we see that Snap-on is yet again quite consistent. Even during 2008-2009, they continued to do well and have been north of 20% over the last 5 years. Lastly, I took a look at their debt levels–which are quite low for Snap-on at about 18% debt/capital. The view above shows the earnings before interest, tax, depreciation, and amortization that would be required, in terms of years, to pay off all debt. All of the above are indicating to me that Snap-on is a company that is still strong and producing solid results. This coupled with their dividend yield and P/E ratios both indicating a potential for being undervalued meant it was time for me to take a nibble. 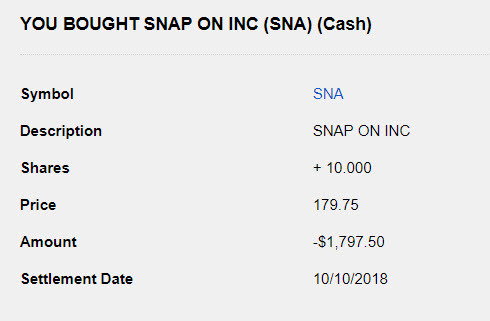 With all of the signs above indicating that now may be a good time to buy Snap-on, I decided to enter a limit order a little below $180/share. In addition, I am testing out a concept that I read about in Phil Town’s book called Rule #1 Investing where when you’re ready to make a buy of a particular stock, don’t buy it all at once but place your first order and then wait for the price to decline. I’m sure that I am not alone in experiencing that. You make a buy and the price continues to decline. As a long-term investor, the small variance really won’t make too much of a difference however I can attest to it happening more often than not–and it happened here as my entry point was not the low of the day. The 10 shares purchased here will add an additional $32.80 in forward dividend income. Overall, this increases my holding in Snap-on to a total of 15.023 shares. While I have not followed up this purchase with a secondary purchase inline with the concept I am testing, I am continuing to watch to see if there will be an opportunity to add more in the $178/share range. If there is some continued downward movement in the price, I will be looking to add a few more shares. As a note, if I were currently paying transaction fees, I might shy away from this approach. However, when I initiated this DGI portfolio with Fidelity I was fortunate to receive 300 free trades therefore I don’t mind smaller purchases. Given that I have been watching Snap-on for a few months now, I am happy that I was able to add to my position at a price below $180/share and will continue to look for an opportunity to add a few more. While their dividend yield is not the greatest, although looking back at the chart above that shows their yield in relation to the 5-year average you will see that my original purchase back in May was when the yield was north of 2.0%, they do provide very nice dividend growth and have done so consistently. Snap-on typically announces their dividend increase in early November and is payable beginning in December. 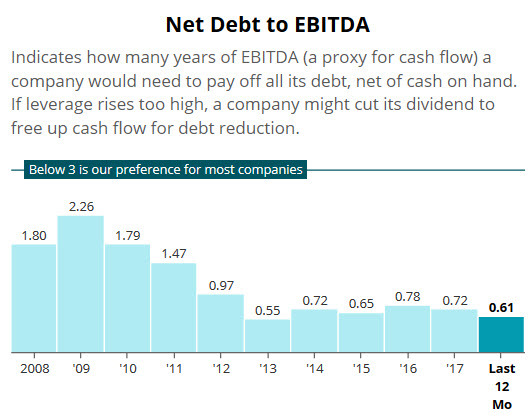 I will be looking forward to that announcement to see if they maintain their 8-year history of increasing the dividend and recent trend of solid double-digit growth. What do you think about this purchase? Also, how do you like the combination of data from FAST Graphs and Simply Safe Dividends? Photos courtesy of FAST Graphs and Simply Safe Dividends. Admittedly, had it not been for the familiarity of the brand due to my boys working in auto shops and buying tools from them, I probably would have glossed over them when I was deciding what to include in my portfolio. However, due to that personal experience with the brand, they caught my eye and ultimately my dollars. Great buy divvydad. Thanks for sharing a very thorough in-depth analysis on why you recommend this stock. I too have not really looked at this company, however I am a fan of their products. I will be looking into this as a future purchase. Thanks for the feedback Dr. D! This is one that is not quite as common across the DGI community from what I have seen, but that is part of the fun in sharing! Nice job adding more income, bottom-line. Safe and sound company, standing ready to increase dividends by double digits for years to come. Thanks Lanny! It is nice to have those opportunities to continue increasing that income, and having a collection of these double-digit growers will certainly help that cause! Snap-on has the best tools and a great warranty for tool replacement . Improving sales, good margins, reducing debt, growing dividend, and decent amount being reinvested through capital expenditures & R&D. What’s not to love. I use a similar buy approach splitting purchases into 3 lots. Its worked pretty well for me with the exception of Pepsi which shot up and I’m still waiting to buy my next 2 lots. Thanks for the feedback Ken, and I am in agreement with you on all points related to Snap-on. With the purchases in multiple lots, do you have defined criteria on when you buy the 2nd and 3rd lots after a purchase? There is that risk of a stock moving up, but I’ve seen it time and time again where the price continues to move lower after I make a buy. That’s why I thought that I would give this a try to see how it works out. If it has strong financials like SNA I buy downward movements of 5% increments. Like you said it usually works but occasionally you happen to buy at a bottom and the downward movement never comes. I just switched to this method earlier this year and noticed this works really when a significant drop occurs in a single day. Appreciate the feedback Ken. As I was mapping out this strategy, I was looking at being a bit more aggressive with the target for the next buy to be around 2-3% lower than the first purchase. I am sure over time I will refine this process, and it helps to hear from others that are doing something similar. An interesting buy. You don’t really see SNA in many DGI portfolios online but these numbers look enticing, especially that dividend growth rate. I see the trucks almost every day parked on busy streets and am familiar with the company but not so much the stock. Thanks for bringing this name to my attention. You’re welcome DH, and they really do have a nice history of dividend growth. Also, given their low payout ratio I believe they have plenty of coverage to continue that level of growth as well. I am really looking forward to their next raise to see if they remain consistent or kick it up a notch. And you’re right that this is one that you don’t see much. I cannot recall it being in a portfolio of the DGI blogs that I frequent, although my memory is suspect these days haha! Nice pickup Divvy Dad. Thanks for the thorough analysis. I was not familiar with the company. Despite the low yield, the DGR looks great, payout ratio is low, and the multiple looks low compared to their recent history. Gotta say, nice job sticking to your price point and getting it at the price you want. I need to get better at doing this! Thanks Bert, I appreciate the feedback and kind words. I’ve definitely got room for improvement on waiting for my price too, as sometimes I just want to get that capital working for me that I stretch a bit. That’s one thing I imagine can always use some improvement. You make a convincing argument for an investment, DivvyDad. I’m not turned off by a lower yield as long as the growth is there, and what’s not to like about that EPS chart since 2009… impressive. Looks like the recent dividend growth has been on the order of 16%, too. I like the addition of the SSD data that you added to the FastGraphs data. It looks nice and is quite informative. The anticipation of a dividend raise just around the corner is an added bonus. Looks like a quality purchase on your part. Keep up the good work. Appreciate the feedback ED, and I am really liking the additional data available to me via SSD in one consolidated location. It has been a nice addition to my toolbox for analysis and monitoring my portfolio. SNA has continued to drop and I am looking to make a secondary purchase with a target between $170.75 and $171.00 as my ideal price. You’re welcome, glad you enjoyed it. I’m sure the lower yield is what keeps this off most people’s radar but I like to have a mix of higher yielding / slower growth companies with some lower yielding / higher growth companies. Of course the ideal is to have the higher yield with higher growth, but that is not as common.